I feel very strongly about suede this season. I have this weird sixth sense for it this fall. I keep sniffing it out and then fangirl over it when I see it. Basically, I am suedes number one fan this season and am not afraid to show it. Suede jackets and boots are great, but my biggest *heart eyes* moments when it comes to suede is over suede skirts. They are just the absolute cutest pieces of clothing my eyes have ever seen and I wear mine far more than I should for only owning one. They just pair so nicely with everything: black sweaters and turtlenecks and white sweaters and chunky knits. I've seen them paired with matching colored suspenders. The greatest thing about this suede skirt trend is that it's everywhere, meaning lots and lots of different price ranges! Hopefully you can find one that fits your body and price range! 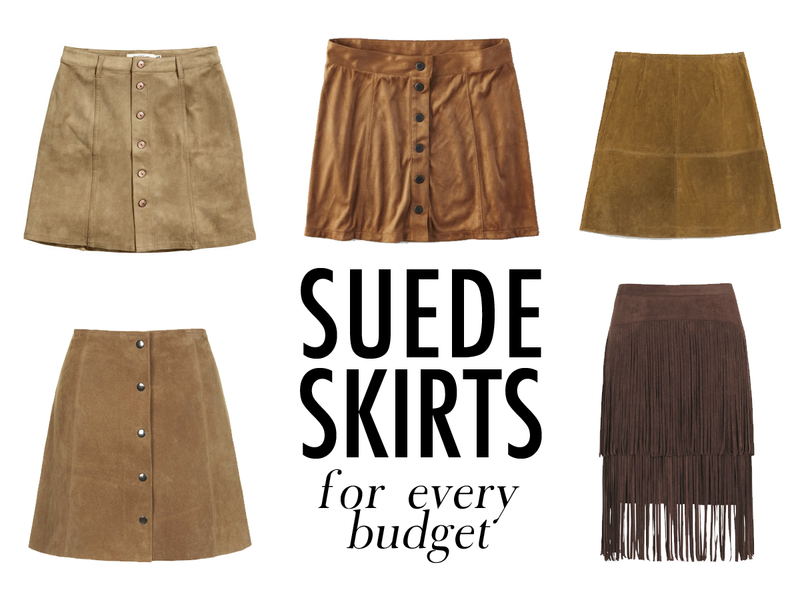 I love love love the suede skirt trend (but sadly don't have one yet). I totally need to snag one of these cute pieces before November!